George Eliot's "favorite painting in all the world" was Raphael's "Sistine Madonna”, which she and George Henry Lewes first viewed at Dresden when she was writing Adam Bede. In her journal, she recorded that on her first sight of the painting she sat down briefly, but then "a sort of awe, as if I were suddenly in the presence of some glorious being, made my heart swell too much for me to remain comfortably, and we hurried out of the room" (Haight 264). Each day as they came to the gallery, they would return last to what Lewes termed “this sublimest picture” (Haight 264). On the one hand, she was culturally predisposed toward Raphael and a Raphaelite norm of beauty - classical, spiritualized, and serene. On the other hand, she could also take pleasure in the style of Rubens - baroque, fleshly and dynamic. (23). 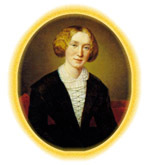 To George Eliot, expression was all-important, being lithe gateway to the soul, the mind, the passions, the sentiments, transmitting the invisible life through a visible language of facial and corporal signs" (Witemeyer 27).